6:05pm ET: Brian Cashman said Sabathia told the Yankees his knee was bothering him following his start yesterday. “Part of the program. No surprises,” said Cashman added. Doesn’t sound like it’ll be a long stint on the disabled list, but we’ll see. 4:59pm ET: The moves have been announced. 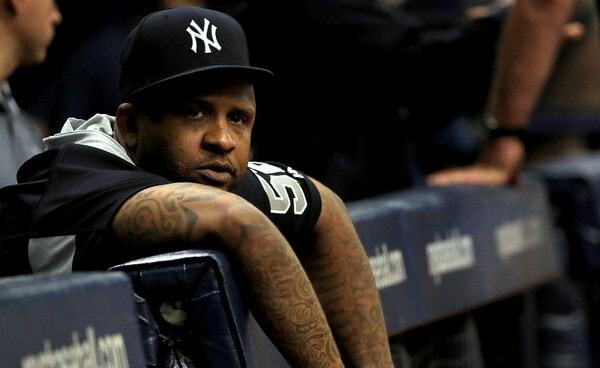 Sabathia is going on the 10-day DL with right knee inflammation. Also, Luke Voit has been optioned to Triple-A Scranton, and both Kontos and Torreyes have been called up. Jordan Montgomery was transferred to the 60-day DL to clear a 40-man roster spot for Kontos. 4:43pm ET: CC Sabathia is being placed on the disabled list, reports George King. There is no word on the nature or severity of his injury yet. Sabathia does have a degenerative right knee condition, so that’s always a possibility. He missed two weeks with a hip strain back in April. George Kontos has been called up to fill the roster spot. Sabathia started yesterday and was marvelous, holding the Rangers to one infield single in six shutout innings. If he got hurt during that start, there was no obvious play in which he suffered the injury. Sabathia retired eight of the final nine batters he faced and looked in control all afternoon. Weird. Depending on the severity of the injury, it is possible Sabathia will miss only one start. The Yankees would need a spot starter for this Friday’s game against the Blue Jays, then, thanks to two off-days next week, they can push Sabathia’s spot all the way back to Tuesday, August 28th. Sonny Gray seems like the obvious rotation fill-in. Sabathia is no longer the workhorse ace he was in his prime, but he does have a 3.32 ERA (4.38 FIP) in 119.1 innings this season. He is ninth in the AL with a 132 ERA+, tied with Charlie Morton. Sabathia has been awesome all year and he’s a very important part of the rotation. Losing him for more than one start would be quite the blow. As for Kontos, the Yankees acquired him from the Indians in a cash trade earlier this month. He’s allowed one run in 4.1 innings with Triple-A Scranton since the trade and has a 4.68 ERA (5.92 FIP) in 25 big league innings with the Pirates and Indians this year. Kontos is the new last guy in the bullpen. Word from Scranton is Ronald Torreyes has been called up as well, which means another move is coming in addition to the Sabathia/Kontos thing. I’m not sure what it is but I really hope Giancarlo Stanton’s hamstring has not gotten worse. That would be devastating. Stay tuned for updates.